Welcome to Karay Metals, one of the best providers of metal products, formed from aluminum, steel, copper, and brass. We are here offer one of our best products — brass rods. These are one of the highest-quality products that found anywhere in the world. Brass is often produced from copper scrap and zinc ingots. Scrap copper is picked based on its impurities, as certain inclusive elements are better in order to produce the best grade of brass needed. The copper is melted first. After melting, zinc is then added at a ratio suitable for the category of brass being produced. At this stage, other types of metals, like lead, aluminum, silicon or arsenic, are added to the mixture to produce the needed alloy. When the molten alloy is ready, it is poured into molds where it now becomes solidifies into large slabs or billets. The billets are then heated a second time and fed through steel rollers. The end product is slabs with a thickness of less than half an inch (<13mm). After cooling, the brass is then fed through a milling machine, or scalper, that cuts a thin layer from the metal in order to remove surface casting defects and oxide. The alloy is heated and then rolled again before it is rolled a second time at lower temperatures to sheets of about 0.1″ (2.5mm) thick. This step is repeated until the required size or hardness is achieved. Finally, the sheets are cut into sizes and sheared to produce the width and length needed. All sheets, cast, forged and extruded brass materials are given a chemical treatment, usually used hydrochloric and sulfuric acid to remove black copper oxide scale and tarnish. The superior finish quality of brass rods is available through Karay Metals in various finish options and shapes. These brass rods are produced and developed as standardized products and find can be used in industry sectors which include electronics, automobiles, engineering, electrical, sanitary fittings and building hardware. Also, we can also offer these quality brass rods in different sizes and diameter options at affordable prices. 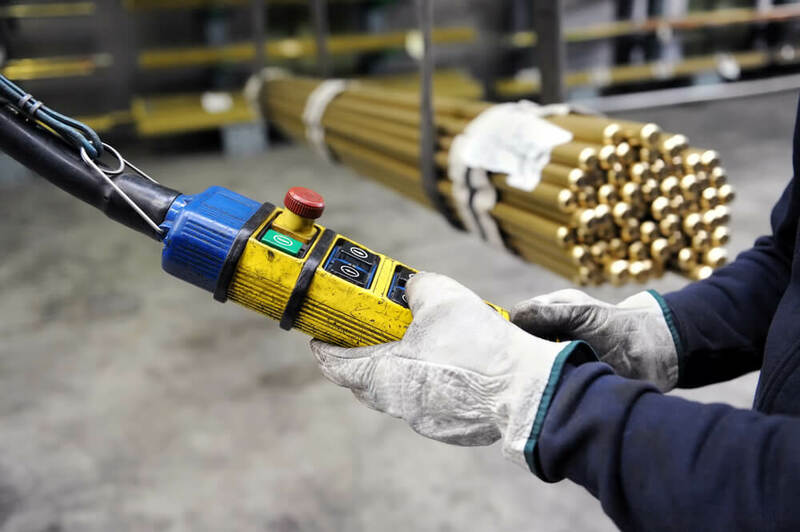 As leading suppliers of forged brass rods, our main aim is to provide rods that meets all international standards and standardized finishes to meet the demands of industries including electronics, automobiles, engineering, electrical, sanitary fittings, building hardware and others. We offer brass rods under specification ASTM B16 for alloys C360, C377 and C385 for hollow and solid rods. Our brass products are produced by some of the finest brass mills in the world. Karay Metals offers ASTM B16/B16M-05, the standard specification for the free-cutting of brass rod, bar, and shapes for use in screw machines. Rounds range from 0.125″ to 2.563″. Hex range from 0.219″ to 2.563″. Square range from 0.188″ to 0.250″. All of this, not to mention the fact that we provide our customers’ exceptional service.